I used to work in video games. Back in 1986, I worked on an Amiga/Atari ST game you’ve never heard of called Alien Fires. I worked on a couple of Nintendo, GameBoy and Super Nintendo games, a few PC games and some other stuff. I’ve created a lot of fonts for video games but also a whole bunch based on video games. Joystix is based on the typical font used on games starting around 1980 and falling out of favor in the 1990s. A lot of Nintendo games used this font as well so it can be used to evoke wistful home gaming halcyon days as well. Crack Man was inspired by the Pac Man logo, obviously. There’s very little consistency in the lettering through the Pac Man series. This might be due to the fact than Namco (Japan) didn’t have full control over how Bally/Midway(USA) was marketing the game. So I got to pick and choose from several game sequels. Zorque was extrapolated from the Infocom logo, makers of wonderful adventure games such as Zork, Enchanter, Planetfall, The Hitchhiker’s Guide to the Galaxy, Leather Goddesses of Phobos & Suspect. I used to play text adventures on my old TRS-80. I doubt that kids today would have the steel attention span and graph paper skills required to get to the end of these. Edifact is a badly scraped up Mattel handheld electronic game. 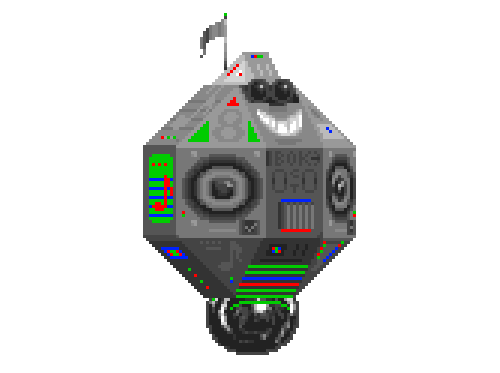 Astron Boy is based on the marquee graphic for a laserdisc space shooter called Astron Belt. Zrnic was inspired by the original Playstation logo. Orange Kid & Lilliput steps were inspired by the classic RPG parody game, Earthbound. I haven’t played it yet but I plan to someday. update 2013: played the fan-translated prequel, Mother all the way through. Iomanoid was inspired by the cabinet graphics for Arkanoid, a paddle game similar to Breakout. In Arkanoid 2, the angular lettering style can be seen in the game itself. I’ve always admired this design for mimicking the angular path of the ball. Chilopod is based on the cabinet graphics for Atari Centipede. I think Atari had the best looking arcade cabinets of that era. Centipede is one of my all time favorite games to play, even though I’m not a skilled player. Snasm has some resemblance to the Super Famicom logo but ended up as something else in the final design. Still, kind of game related. Zolasixx is an angular techno font, inspired by Zaxxon. Chromakey started life as a nod to Matrix Marauders. Superego was inspired by the cabinet graphics for Stargate – Defender II. Gameness has a little bit of a Game Boy Final Fantasy Legend thing going on.